Death is a fictional character from the DC comic book series, The Sandman (1989–1996). 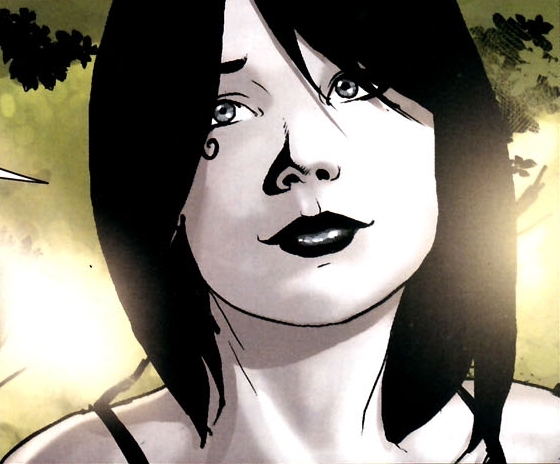 The character first appeared in The Sandman vol. 2, #8 (August 1989), and was created by Neil Gaiman and Mike Dringenberg. In the stories, Death is both the end of life and a psychopomp. Like most anthropomorphic personifications of death, Death meets with the recently deceased and guides them into their new existence. 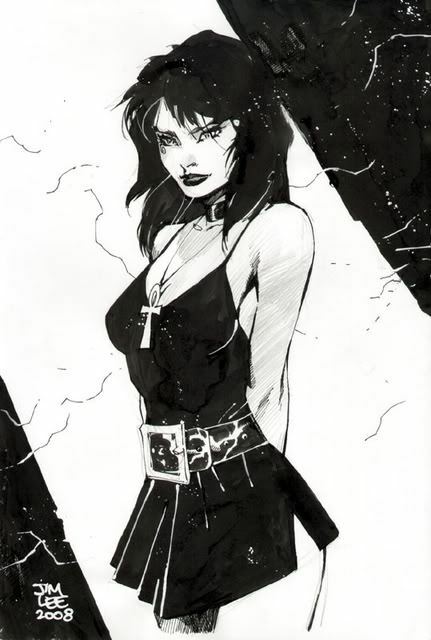 However, unlike most personifications of death, she also visits people as they are born, according to Destruction in the Sandman Special. Evidently, only she seems to remember these encounters. In the special issue, it is also revealed that Death was known in Ancient Greece as Teleute. Physically, Death is also opposite to the traditional western culture personification of death (see Grim Reaper). 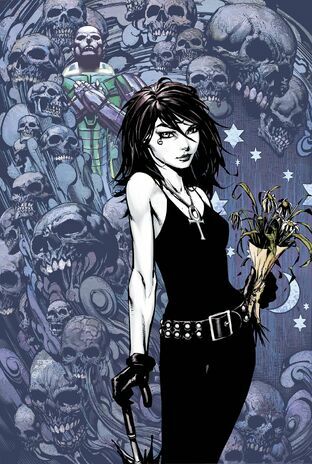 In The Sandman, Death instead appears as an attractive, pale young goth woman dressed in casual clothes - often a black top and jeans. She also wears a silver ankh on a chain around her neck, and has a marking similar to the eye of Horus around her right eye. She is pleasant, down-to-earth, perky, and has been a nurturing figure for both incarnations of Dream. 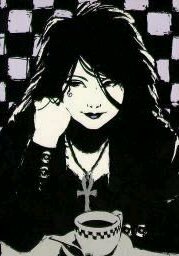 This irony has helped make Death one of the most popular characters from Sandman. Death was named the fifteenth greatest comic book character by Empire Magazine. She was ranked second in Comics Buyer's Guide's "100 Sexiest Women in Comics" list. Origin: Born into existence shortly after the first lifeforms appeared in the universe. the very last living thing died. After that she was destined to put the universe to rest. After Despair was murdered Death and the Endless went to the necropolis to put her body to rest. The necropolitans had long lost their passion for their job, and didn't know about the necropolis' arrangement with the Endless, so they laughed at them when they asked for Despair's cerements and the book of rituals. The Endless revoked the necropolis' charter, causing it to be destroyed. The village of Litharge was granted a charter by the Endless and became the new necropolis. Destruction called a family meeting of the Endless, and announced to Death and the rest of his family that he was abandoning his duties as one of the Endless and taking his leave of them for good. Dream made a bet with Despair that the power of dreams could save Joshua Norton from despair. He gave Joshua the dream of becoming Norton I, emperor of the United States. Death met with Dream and told him she had her doubts about what he was doing, especially since the elder members of the Endless usually avoided the games Despair, Desire and Delirium engaged in. Emperor Norton I died, and Death took him. She told him that she had taken every king, emperor and ruler in history into the afterlife, and of all those she'd met Norton was by far her favorite. Death spent one day of the century as a mortal, as was her custom. She took the form of a peasant girl and spent the day by the Yangtze River with a young ox driver who told her his grand schemes and plans. Death met up with her brother Dream and yelled at him for not getting a hold of her earlier after he'd been released from decades of imprisonment. She told him to stop moping just because he felt purposeless after finishing a quest to retrieve his helm, pouch and Dreamstone. Death had him accompany her while she went about her work and cheered him up a good deal. Death heard Element Girl crying and walked into her apartment to talk to her. Element Girl hated her life as a metamorph, and asked Death to take her. Death told her she couldn't but since Ra made the metamorphs she advised Element Girl to speak to him, to speak to the sun, and kindly ask him for an end. Element Girl took Death's advice, and Ra took her life. Death wished Element Girl better luck in her next life. Destiny called a gathering of the Endless, telling them a meeting with the Fates made him aware that he had to call the family gathering to set in motion a chain of events that would cause change and upheaval. During the course of conversation Desire got under Dream's skin by reminding him of Nada. Dream was indignant, but Death said she agreed with Desire, sending his lover to Hell for spurning him was an awful thing to do. Dream vowed to make amends by journeying to Hell and saving Nada's soul. very busy containing all the souls Lucifer Morningstar freed from Hell when he abdicated his realm. Death came to take Charles Rowland into the afterlife, but his spirit wouldn't abandon his friend Edwin Paine. Death explained that Paine was already a ghost, one of the souls released from Hell when Lucifer retired. Rowland refused to leave his friend, so Death, who was already completely overworked, allowed Rowland to remain on Earth as a ghost. Death took Wanda, who was killed when the witch woman Thessaly brought the moon down to the Earth. Before they left for the afterlife she let Wanda wave goodbye to her good friend Barbie. Death took Bernie Capax, one of Destruction's old friends. When Destruction left the Endless he set up a safeguard that would make it difficult for his family to track him down, and it caused the deaths of several of his friends when Dream and Delirium sought him out. Dream called Death to the Dreaming for advice after he ended his search for Destruction. Death was angry with him because when Dream refused to continue seeking Destruction he was harsh with Delirium, and as a result she closed off her realm. Death told him she was worried Delirium might leave the Endless like Destruction did, and she advised he apologize to her for being so rude. On a parallel Earth Death took Prez into the afterlife. Death didn't like the fact that in that world's afterlife Prez would be in the hands of Boss Smiley, so she told Dream of her interest in Prez and asked him to save Prez from Smiley. order to save the Dreaming, and Death took Dream. Personification of Death: One of the seven Endless, inconceivably powerful beings, Death is both lord and personification of all death and life, Death meets with the recently deceased and guides them into their new existence. Unlike most personifications of death, she also visits people as they are born. Evidently, only she seems to remember these encounters. Gift of Death: has the power to free the soul of a body and send a soul to his appropriate destination (usually an afterlife or reincarnation). Death often leaves this task to various Death Gods. For Death Gods or demons to claim a soul instead of Death herself, they usually have to have a valid claim on the soul; either a contract or the deceased worshipped the Death God's pantheon. The exact nature of the relationship between Death Gods and Death itself is unknown. Gift of Life: Death apparently is also there at the time of ones birth and can infuse a body with life. She commonly does this at the time of birth or at certain times to give another a second chance (reincarnation) the criteria for the latter is not known. Omnipresence: Being Death, she is everywhere on Earth at any moment, but not in a form visible to humans, usually. Omniscience: Death is possibly the most powerful of the Endless having been shown (in a flashback in Brief Lives) to be virtually omniscient and being able to intimidate the Furies, who show no fear of the other Endless, simply by raising her voice. She knows all of the life of those under her auspice. Shapeshifting: Death could change her appearance and clothing. Immortal: Death was ageless and virtually immortal. Ancient Rules: Despite her great powers Death, like the rest of the Endless, was bound to a complex set of rules and customs.